Ran a few battles today and i still got my mojo, some were defeats of course but hey I'm back. Welcome back! Going to make vids again? Glad you’re back Lauren. Can we expect any videos of your mojo in action? Very nice, I'm totally peanut butter and jealous. Looking at the negative credit earnings on very good performances, I’m suddenly reminded as to why I’ve been in no hurry to play tiers 9 and 10 (that and sucking in 7 and 8). Edited by richdubz, 01 March 2019 - 10:16 PM. Looking at the negative credit earnings on very good performances, I’m suddenly reminded as to why I’ve been in no hurry to play tiers 9 and 10. I mean, seriously. 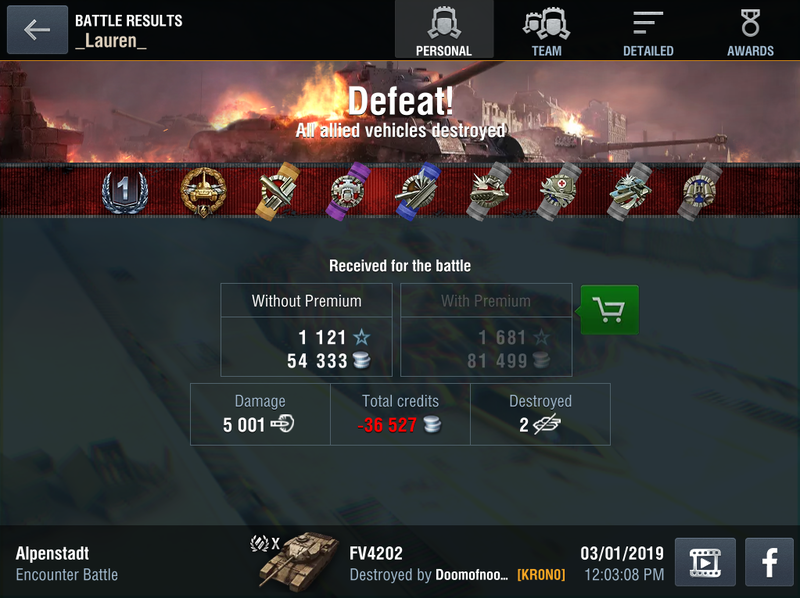 A doggone Ace Mastery with over 5000 hp in damage done, and she loses credits? Fils de tu connais quoi, ça. Fils de tu connais quoi, ça. Why is it that you can say hijo de puta in French, and I can’t say it in English? French bias! 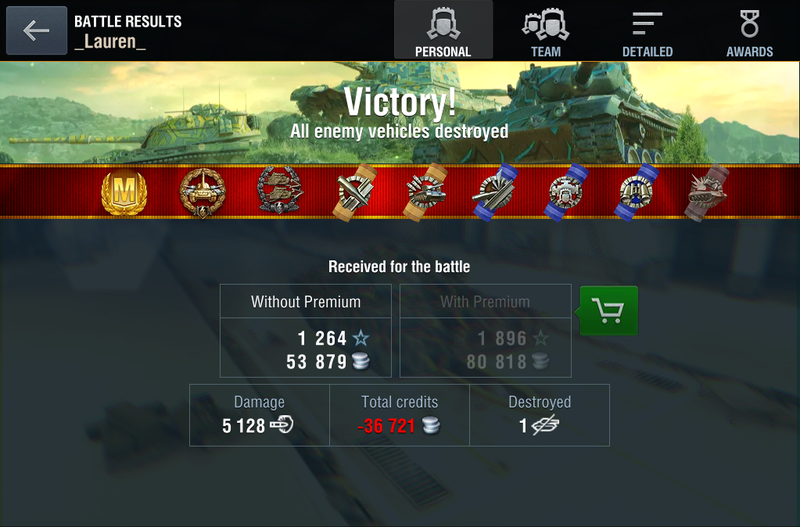 To be fair, most tier 10s make pretty trash credits, but have high operating costs. If memory serves, the lowest is the jagdpanzer e100, with 64% coefficient. I didn't actually follow through with it - up there I wrote "son of a you-know-what" (that's the actual translation of what I said). You certainly couldn't say it in battle chat - it gets "asterisked" (or so I am told). Interesting that you can type the Spanish equivalent here, and it doesn't get edited. C'mon, Man. You dish out 5 grand in damage and get a Happy Meal, you shouldn't lose credits. There's nothing fair about that at all! Edited by TonnerreCadien, 01 March 2019 - 11:00 PM. This is why I have no wish to get there, even if I could. It would be cool to get those better tanks tho. You only get 5k in the FV4202 by slinging hesh and that's expensive. Not to mention using any consumables. But ya tier 10 is expensive. It's not fair, but that's what WG wants, they want the top of the tech tree in WOT to be expensive, forcing an incentive to spend cash on tier 8 premiums to cover the costs of running tier 10s. Or at least, that's how i see it. Not true, I did 6700 in fv4202 with the heat gun. 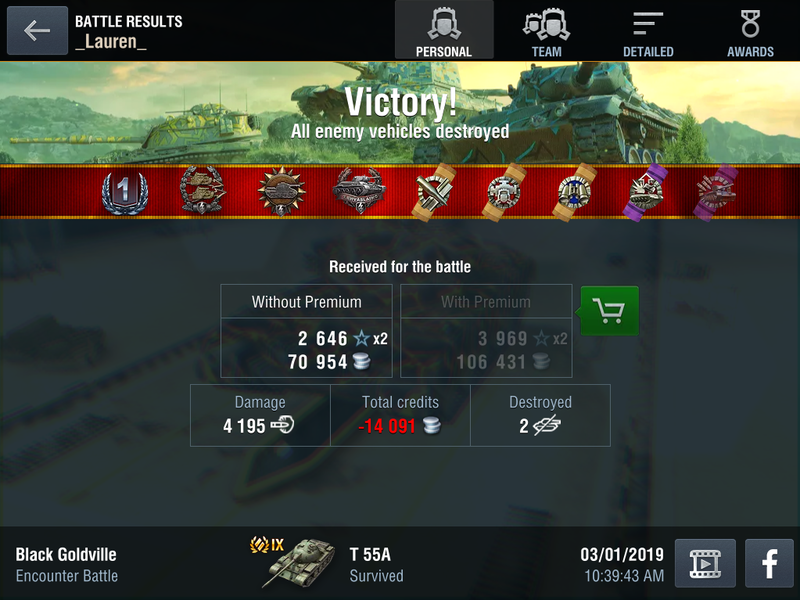 People hate on it but it's as good as any other tier x med.